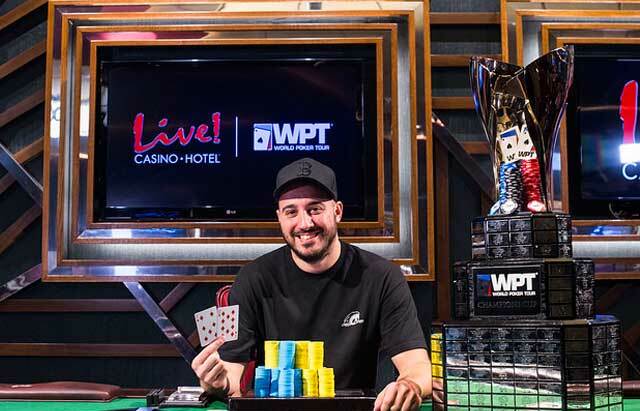 Tony Ruberto picked up his 2nd WPT title by winning the WPT Maryland at Live! Casino Main Event. On Tuesday night, World Poker Tour Champions Club member Tony Ruberto defeated the 554 player field of WPT Maryland at Live! Casino Main Event, taking home $344,755 and earning his second WPT title. In addition to Ruberto, the final table of the World Poker Tour Maryland Live featured experienced players from all over the poker spectrum. Perhaps the most notable would be PokerGo on-air talent and one-time World Series of Poker final table participant Jeremy Ausmus. Also taking their shot at a first WPT title was WSOP bracelet winner and final table chip leader William Givens, HPT and MSPT Main Event winner Mark Sandness, former WPT final table participant Shankar Pillai and cash game specialist Aaron Pinson. The first elimination of the day came within the first ten hands of the final table as Sandness three-bet shoved his roughly 27 big blind stack over an open from Ruberto with . Roberto’s quickly called with his . The board ran out clean offering no pair for either player and Sandness exited in sixth place for $69,609. The cash is the second WPT result for the Heartland Poker Tour Main Event Champion, pushing his live career total earnings over $700,000. It took nearly an hour for the next player to fall. Pinson, who came in as the shortest stack but doubled early, laddered into fifth position but ran into a big hand from Ruberto. After a raise from Ausmus, Ruberto three-bet with only to have Pinson four-bet shove 20 big blinds holding . Ausmus let his hand go and Ruberto showed Pinson the bad news. The board ran out sending Pinson home in fifth place for a career-best $91.230. As is often the case when tournaments wind down, big flips determine the fate of the players. After a raise from Pillai and a call from Ruberto, Givens three-bet from the big blind with . With the action back on Pillai, he put in another raise that squeezed Ruberto out of the hand. The raise was big enough to put Givens’ tournament at risk. Givens called and Pillai turned over . This was a big flip for Givens. The flop came down keeping Pillai in the lead with some additional backup outs. When the fell on the turn. Givens added some equity. But the river sealed the hand for Pillai and Givens, a WSOP bracelet winner, was sent to the cage in fourth for the six-figure sum of $121,112. He’ll add that to his already impressive $1.7 million in lifetime earnings. An hour later Jeremy Ausmus was short-stacked but still fighting for the opportunity to win his first WPT title. In a blind on blind confrontation, Ausmus limped holding and Ruberto checked his option with the . The flop came giving Ruberto bottom pair however Ausmus was still in the lead. Ausmus checked, Ruberto put in a small bet, Ausmus called. The turn was the . Ausmus checked again and after Ruberto followed up with another bet, Ausmus check-raised all in. Roberto called and Ausmus was at risk needing some help. The river was no help and the part-time PokerGo commentator’s WPT run ended in third for $162,597. Roberto entered heads-up play against Pillai with a 4.5-1 advantage. While Pillai would find a double and bring the chip counts nearly event, after nearly two hours of play the pair would find a flop they both liked enough to get it all in. Pillai raised the button with and Ruberto, holding a better than 2:1 chip advantage called with his . The flop was action. . Roberto checked from the big blind, Pillai bet. Roberto check-raised. Pillai tank-shoved. Roberto eventually made the call putting Pillai’s tournament at risk. The turn was the giving Ruberto a gutshot straight draw to go with his flush draw. The river was the , not only giving Ruberto the flush, but also the victory. Pillai finished as the runner-up and earned $220,780. Tony Ruberto is the winner of WPT Maryland, earning $344,755 for first and his second World Poker Tour title. The World Poker Tour’s next stop will be the WPT bestbet Bounty Scramble in Jacksonville, FL on October 19.